The Reverend William Reid suffered the wrath of John Logan, friend of Robert Burns, and other heritors when he proposed to cut down trees in the glebe which he claimed were ‘going fast to decay and rendered the manse uncomfortable from damp and smoke’. The case went to the Court of Session (1799) which came out in favour of the minister. This was a difficult time for the Church of Scotland and national schisms fractured the congregation of the Auld Kirk with some parishioners joining the Reformed Presbyterians (New Cumnock) or, Burghers (Old Cumnock) or Anti-Burghers (Auchinleck). 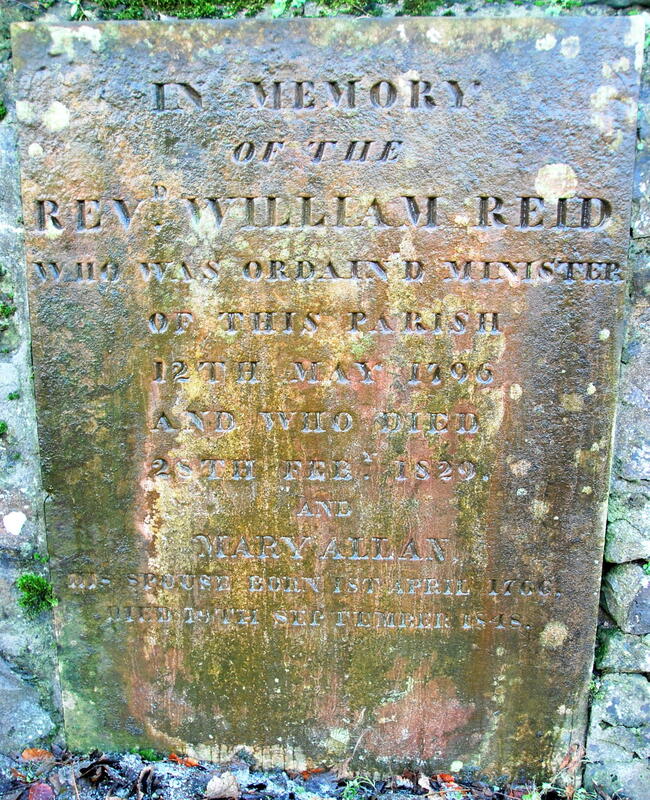 The Reverend William Reid served the parish for 33 years before passing away in 1829 and lies buried against the kirkyard wall, the last of the Auld Kirk ministers to be buried here. His widow Margaret moved to Symington perhaps living at the manse with the Reverend Thomas McWharrie and his family – he is recorded as Commissioner (of oath) in the Will and Testament of the Reverend Reid. Margaret later lived at the manse at Dreghorn, then home to Reverend John Jamieson and his wife Mary Young, the daughter of William Young and Ann Allan – presumably a relative of Margaret’s. She passed away in 1848 and was laid to rest alongside her husband in the Auld Kirkyard, New Cumnock. WILLIAM REID, a native of Annan ; educated at Marischal College, Aberdeen ; pres. by Patrick, Earl of Dumfries, 10th Dec. 1795 ; ord. 12th May 1796. He was interdicted by several heritors from cutting down grown trees on his glebe, but the interdict was recalled on appeal by the Court of Session 16th May 1799. He died 28th Feb. 1829. He marr. 22nd Aug. 1796, Mary (died 19th Sept. 1848), daugh. of Richard Allan of North Bardowie.